Elzada Clover and Lois Jotter Cutter were the first women to successfully run the length of the river in the Grand Canyon. Dr. Elzada Clover was a botanist working as the curator of the University of Michigan’s botanical gardens. She was originally planning a mule trip through the Grand Canyon to identify cacti and succulents but conspired with Norm Nevills to turn it into a river trip. Lois Jotter Cutter was a graduate student at the time and joined her on the trip. Clover became the first botanist to record plant life in the canyon. A graduate student on the trip left after a conflict and was replaced with Emery Kolb. 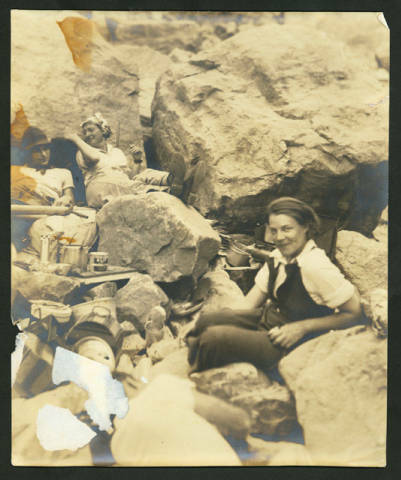 Botanical study of the Grand Canyon by Elsie Clover and Lois Jotter, first two women on the first commercial trip down the Colorado River [constructed title], 1938.